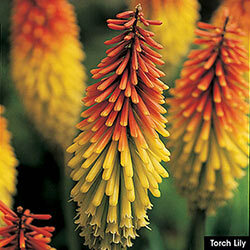 Large, graceful spikes are filled with tiny, individual tubular flowers arranged in a raceme atop a tall, sturdy stem. Lilylike leaves add to its attractive foliage while the bright, warmly colored blooms provide a dramatic display in full sun. A hummingbird favorite! Bloom Time Early to midsummer. Foliage Type: 1" wide gray green, linear sword shaped to 3' long. Margins are rough. Bloom Time: Early to midsummer. 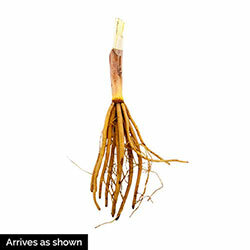 Flower Form: Spike of tiny individual drooping tubular flowers arranged in a raceme at the top of the flowering stem. Soil Requirements: Well drained soil do not like wet feet. Pruning: After flowering cut down stalk and the foliage about half way, and will grow back next year. Winter Care: In colder climates, protect with a 2-4" layer of mulch.